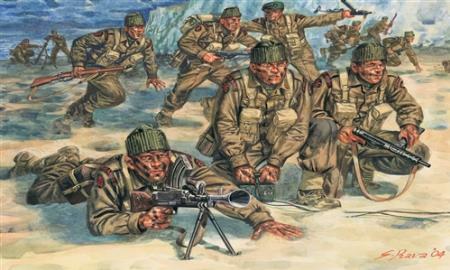 The “Commandos” were created at the beginning of the 40's as a special unit of the British army intended to carry out fast operations. The commandos operated in small, highly mobile and well-equipped units, assigned to recon and, most of the times, assault missions. In 1941, in addition, the “Special Air Services” were formed, to perform guerrilla and sabotage missions behind enemy lines. In 1942, the Royal Marines were added to the elite units of the British Army.